FILE - A worker lifts a lunch bowl off the production line at Spyce, a restaurant which uses a robotic cooking process, in Boston, Massachusetts, May 3, 2018. Muro said the timeline for the changes could be “a few years or it could be two decades.” But it's likely that automation will happen more swiftly during the next economic downturn. Businesses are typically eager to implement cost-cutting technology as they lay off workers. 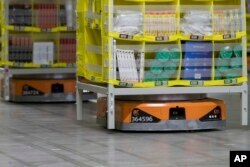 FILE - Pods full of merchandise are moved around the floor by robotic drives, named Amazon robots, at the Amazon fulfillment center in the Staten Island borough of New York, Dec. 5, 2018. But Cortes said there's no doubt there are “clear winners and losers.” In the recent past, those hardest hit were men with low levels of education who dominated manufacturing and other blue-collar jobs, and women with intermediate levels of education who dominated clerical and administrative positions.